Internal Revenue Service (IRS) Form 2290 is titled "Heavy Highway Vehicle Use Tax Return." It is also known as the "Highway Use Tax Return." It is mainly used to pay taxes for operating vehicles weighing more than 55,000 pounds. The form must be completed by any individual, owner, Limited Liability Company, corporation, partnership or other organization, including charities, which operates a vehicle of the appropriate weight. Vehicles used by federal or state government agencies, Indian tribal nations, the American Red Cross, rescue groups such as fire or police stations are excluded. Blood collection and mass transit vehicles are also excluded. The form applies only to a specific period of time, which does not accord with the calendar year. The current version of the form applies to vehicle used between July 1, 2010 and June 30, 2011. The form and any required payment are due by the end of August of the corresponding year. In 2011, the due date is August 31, 2011. The IRS requires that forms covering 25 or more vehicles be electronically filed. Other forms may also be electronically filed, but may also be mailed. The form consists of three parts: an identification section and two sections in which the taxpayer identifies the purpose for filing the form and the amount of tax they owe, if any. In the first section, the taxpayer provides their name and address as well as the employer identification number associated with the vehicle. An individual owner and operator of the vehicle cannot use their Social Security number in this section. If they do not have a tax identification number, they must apply for one with the IRS prior to filing the form. Immediately below this area the taxpayer must identify whether their purpose for filing the form falls into one of four categories: an address change, amended return, a vehicle identification number (VIN) change or that they no longer have vehicles to report, which the IRS refers to as "final return." This information is important because, if it applies, the taxpayer does not need to calculate the amount of tax due. Checking the box tells the IRS which sections of the form are relevant and were, therefore, completed by the taxpayer. In Part I of the form, the taxpayer determines the amount of tax owed. In this section, the taxpayer identifies whether the truck was operated during the applicable period. The taxpayer then determines how much tax is owed based on the vehicle's weight. The taxable information is contained on page two of the form. Next, the taxpayer identifies whether the vehicle was overweight and if any credits are available. 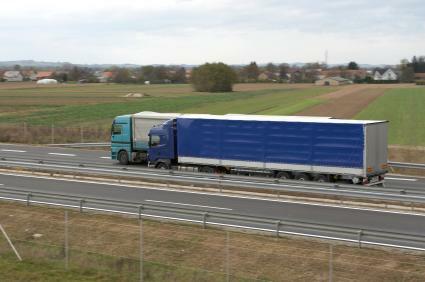 Specific values for overweight vehicles are contained in section 5 of the form's instructions. Finally, the taxpayer subtracts any credits from the total amount of tax owed to determine the amount of tax liability. Part II only applies if the taxpayer is requesting a suspension of tax obligations. Reasons for doing so include that the vehicle was not subject to the tax in the previous year, that the vehicle is no longer owned or that the vehicle is not operated on public highways. Note that this section indicates that the form must be filed regardless of whether any tax is owed. Therefore, any owners or operators of vehicles weighing more than 55,000 pounds must submit this form. Finally, the form must be signed by the taxpayer and submitted to the IRS. The taxpayer may indicate a third party that they permit to have contact with the IRS regarding their return. This third party may be a lawyer, the truck's new owner or another relevant person. This section also contains an area in which the taxpayer may identify a third party to whom they owe a report of their filing the form. Many times, states require that all heavy trucks registered or operated within their borders provide proof of their filing. The IRS provides owners and operators of multiple vehicles to include them in the same form. The Schedule attached to Form 2290 allows the taxpayer to list the VINs of all included vehicles. Multiples entries may be made in a separate sheet of paper and attached to the form. The Schedule is divided into three sections, one for listing vehicles upon which tax is owed, one for listing vehicles under a suspension and a summary section of the total number of vehicles included on the form. These sections must be completed anytime the form pertains to more than one vehicle. There are actually two identical half-sheet Schedules attached to the form. Only one must be submitted. If you own or operate a vehicle weighing more than 55,000 pounds, you must complete IRS form 2290. Typically, the form and payment are due at the end of August of the corresponding year.